From the Editor. Forgiveness is central to Christian orthodoxy, rightly understood. For those who conceive of orthodoxy as a means of their always being right about doctrine, forgiveness is often in short supply. And yet, ironically, this attitude guarantees that much important doctrine is overlooked. All that Scripture and Reformed confessions articulate about the person and work of Christ teaches us, among many other things, that we are forgiven. An essential fruit of that knowledge is that we learn to be forgiving. In three decades of ministry some of the worst church problems that I observed remainedand in some cases, remain to this dayunresolved, precisely because of a lack of forgiveness. 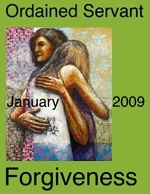 An excellent way to begin the new year is by renewing our practice of forgiving others. Brenton Ferry's pointed article on forgiveness should help us in that pursuit. My review of Frank Schaeffer's autobiography should provide some cautionary material on this important aspect of our spiritual formation. Ultimately we cultivate a mentality of forgiveness by contemplating our Savior's suffering on the crossexecuted for our sins.
" 'That Offends Me!' " (Larry Wilson) 8:2 (Mar. 1999): 36-38. Ordained Servant exists to help encourage, inform, and equip church officers for faithful, effective, and God glorifying ministry in the visible church of the Lord Jesus Christ. Its primary audience is ministers, elders, and deacons of the Orthodox Presbyterian Church, as well as interested officers from other Presbyterian and Reformed churches. Through high quality editorials, articles, and book reviews we endeavor to stimulate clear thinking and the consistent practice of historic Presbyterianism.